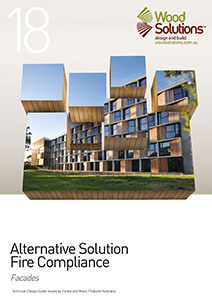 Timber has been used for many building applications and has many advantages over other building products, including its environmental sustainability credentials and comparatively light weight. In recent times, timber has not been used in multi-storey buildings because the prescriptive requirements of the National Construction Code (NCC)1 , the Deemed-to-Satisfy Provisions do not allow some building elements to be constructed from combustible materials. 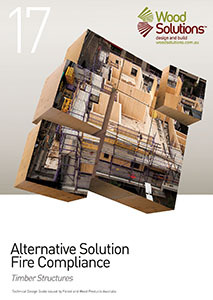 Alternative Solutions may be developed by an accredited/registered Fire Safety Engineer as part of a building solution to allow the use of timber in specific applications not covered by the Deemed-to-Satisfy Provisions of the NCC. This guide is currently being reviewed and updated. 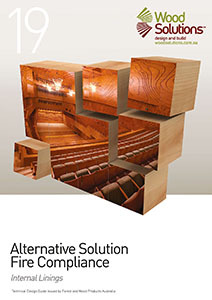 Please check the WoodSolutions newsletter for news about the new guide.